Did you know, the female narrator for Clandestine is a talented London based musician and recording artist? She has just released the music video for her new song “Sly Girl”. Check it out and be sure to keep up with Nathalie Nahai at http://www.nathalienahai.com. Directed by Richard Hadley. A Ballistic production http://go-ballistic.com. For those of you that weren’t able to make it, or those who still are going through IDFA withdrawals, here is a brief photo narrative or out world premiere at the 22nd International Documentary Film Festival Amsterdam. Pardon our mess while we shuffle things around a bit. If you had blog.clandestine-movie.com bookmarked. Please adjust to clandestine-movie.com/blog. Here is the newest trailer released specifically for the International Documentary Film Festival Amsterdam. 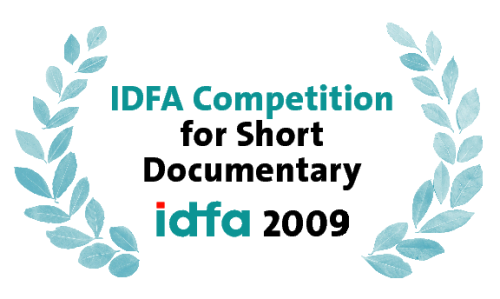 Look for it also on IDFA’s Clandestine page. IDFA has written up a wonderful synopsis for Clandestine, also published are the showtimes for the film while it is in Amsterdam. Come on out if you can make it! I’d like to tell you our good news. This morning we received word from the Netherlands that our film, Clandestine, has been accepted to the International Documentary Festival Amsterdam (IDFA) for their short documentary competition. It is an incredible honor for us, and is an exciting way for us to have our World Premiere. The festival is November 19th-29th but we don’t know yet what time or date our film will be showing. We are coordinating with IDFA and making our travel arrangements to Amsterdam. Thank you for reading the blog, waiting for the movie, and for your support. More details will surely come soon. About the Prelingers and their endeavors: The Prelinger Archives is a collection some 60,000 industrial and ephemeral films discovered and preserved by Rick Prelinger since 1982. After being acquired by the Library of Congress in 2002 the Prelingers have placed over 2,000 of their films into the public domain and made available for download through the Internet Archive. From this source, Clandestine draws near 80% of its visual material. In 2004 Megan Shaw Prelinger, along with Rick, established the Prelinger Library which houses over 50,000 books and pieces of ephemera. Last weekend I visited San Francisco with my brother Donny. Besides doing the usual site-seeing we made an effort to visit the Prelinger Library during their public hours of operation. We discovered Megan and Rick there, working hard, labelling, preparing, and sorting various types of ephemera. I was flattered to find out that Rick had already known about Clandestine and already had some ideas of places for me to research and people to get acquainted with. He directed me to a collection of Monitoring Times periodicals that he has subscribed to for many years. I was impressed to find out how interested Rick was in radio, radio history, Numbers Stations and other types of ambient noise. At one point in the conversation he retrieved a scanner from his carryall and we began listening to whatever signals it would pick up from the surrounding area. We all spoke about the state of film and documentaries, about giving things away, about the Library, its history, and other archives and libraries in the south and around the country that are worth visiting. My brother and I dug into their collection of the Official Gazette of U.S. Patents in hopes of finding a patent with our Great Great Uncle’s name attached. (A feat that we quickly realized could not be accomplished during our time there.) Donny flipped through music and aviation ephemera, and I went looking for items related to some of Climenole’s upcoming projects. All of this while the Library was filled with sound of opera coming from Megan’s stereo. If you’re in San Francisco make time to visit the Prelinger Library. The library is at 301 8th Street (corner of Folsom Street), Room 215 in San Francisco. See website for public hours. Readers: Read Paste Magazine’s brief post on Numbers Stations and popular music. As many of you know Nathalie Nahai, the female voice of Clandestine, is a talented London-based musician. She has released a teaser to her upcoming music video and single, Sly Girl. Find out more about Nathalie at her website http://www.nathalienahai.com/.